K2 University has helped many budding Salesforce consultants and future IT specialists excel in their careers. This blog series focuses on the stories behind some of K2 University’s Salesforce Trailblazers, highlighting a bit about their background; what they were doing before taking the course, their thoughts about how the course went and their future career plans. This month we spoke to Javier Belaúnde, now a Salesforce Certified Administrator in Madrid, Spain. Javier signed up for our Salesforce ADM201 Exam Preparation course. I’ve been working as a graphic designer in several advertising and marketing-related companies for most of my professional career. I’ve been always interested in creativity and helping others by designing graphic solutions for their projects. I’ve been lucky enough to have had the opportunity to develop different skills while working for all these companies and many other customers, that’s why I’ve always had to learn to use new tools and adapt to different business processes. I found out about Salesforce CRM for the very first time in my last role where I was assigned to do the implementation and configuration of our company’s org. So, for the past two years not only have I been working as a designer but also a Salesforce Admin as well. When I began working as a Salesforce Admin, I felt I needed to learn more about this CRM. At first, I didn’t know about Salesforce Certifications, but then one day I received a message from Ewa Jurewicz from K2 University, suggesting that I take a course to become a Certified Salesforce Admin. I was curious about it, and after reading a lot of information about how important it is to be certified, I was convinced to take the exam. Once I had read through the information K2 shared with me about their Exam Preparation for the Salesforce ADM201 course, I decided because of the teacher’s experience, the flexibility to take the course online, and the competitive price it was the right time to make that choice. Which K2 University course(s) did you take and how did it go? I took the official exam preparation course for the Salesforce ADM201 certification as the online course better suited my job schedule. Our teacher, Luca Manera, clearly explained everything to us in a very practical way. First of all, we learned the concepts, and later we practiced with different exercises and challenges. The course was very enjoyable and offered a complete all-round learning, perfect for preparing all aspects of the exam. One month after finishing the course, I sat the certification exam and easily passed on the first try, so I’m glad I chose K2 University to prepare it. How has taking the course changed your career with Salesforce? K2 helped me to understand the importance of having a good theoretical base to work from as a Salesforce Administrator. When I took my initial step into Salesforce two year ago, a lot of my experience was based on trial and error, so there were too many things I really didn’t understand. Taking K2’s course was a real game changer. After getting my Certification, I realized I had gained enough knowledge to solve problems easily, and understand how to apply the best practices to the processes. As a result of all of this, my professional profile as a Salesforce Certified Administrator has dramatically increased my confidence and exposure to new job opportunities. 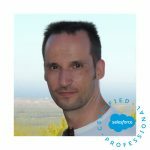 Javier Belaunde, Salesforce Certified Administrator based in Madrid, Spain. Visit the K2 University page for more information on upcoming courses and exclusive discounts available for the K2 consultant community. Consultant looking for your next project? Find your next IT role with us today.